Are Imitation Marble Window Sills Good as Natural Stone? Like everything, you’ll have your pros and cons when you’re trying to decide whether to stock your warehouses with natural stone or imitation marble. The ultimate decision will be based on who you’re building for as well as what the budget looks like. That’s going to determine quick, fast, and in a hurry which type of window sill you’re going to incorporate into a build. In all honesty, the smartest decision will be to stock both kinds. But since natural marble stone comes in an array of different color variations, determining exactly which kind can take a lot of time to process because whatever kind of material you choose to stock, it needs to appeal to a vast audience of buyers. That’s a tall order! Getting the right kind of window sill is expected and may not get much recognition from a buyer, but getting the wrong kind can be might be a little more noticeable. The truth is you can’t and won’t please everyone with your design choices, no matter how subtle they are. Window sills aren’t exactly one of the main design choices that builders and maybe even buyers look at, but if the builder chooses the wrong kind of window sill, they will. Make sense? You want to make a build that’s going to impress potential buyers, but not turn them off. Depending on the market, you may very well get away with installing imitation marble window sills. Some people are perfectly fine with imitation marble window sills. Others aren’t. It’s up to you as the builder to determine which is going to be the better investment. There are certain situations where imitation marble window sills may come in handy. For instance, if you are doing a flip, an inexpensive material that offers the look and quality of natural marble stone will come in extremely handy. Typically in a flip, even with a set budget, things tend to get out of hand moneywise, because once you start opening walls, there could be a myriad of problems to fix. The electrical might not be up to code. The pipes may be old, rusted, and broken, or worse a foundation problem needs to be addressed. These types of fixes can easily eat into a budget. And suddenly those marble floors become laminate or carpet, but you don’ t have to pull back on everything. That’s where the imitation marble window sills come to save the day! However, the question still remains: Is it better than natural stone? There’s really no hard answer here because it’s all a matter of preference. If you desire to have natural stone in your home or commercial build, then yes! It is absolutely better than imitation window sills. Now if you prefer to have the look of natural stone without the annual upkeep of sealing it, then yes! Imitation stone is better than natural stone. It’s all about what you want and what you’re willing to put up with. There is no right or wrong answer here. So, let’s talk about the differences between the two. First, it’s important to understand how each one of these materials was made. Even though natural marble is organic, there was still a natural process to its formation. Marble is made mainly out of limestone, but when it gets too hot—and it can, then it will eventually melt. This usually happens when it’s in close proximity to the earth’s core or through seismic activity. In such a case, every other mineral melts along with it, including any fossil material. All this melts together and once it eventually crystalizes, it hardens becoming a stronger type of mineral. Marble is basically a tempered stone that is formed from extreme heat. Therefore, you don’t have to worry about your marble window sill being flammable or getting damaged. While your natural marble window sills may be fire-proof and water-proof, it’s still a slightly porous mineral. What that means is if you spill wine, ketchup, or any acidic substance on its unsealed surface, you risk discoloring it and losing its lustrous appearance. Imitation marble window sills on the other hand, is just a mixture of recycled stone formed together with a type of epoxy that seals it all together. So with imitation marble window sills, there is no fear of staining the surface because it already comes pre-sealed. With natural marble window sills, that is not the case. Natural marble window sills will need to be treated with a sealant every 12-16 months. Since we’re talking about window sills, you can probably get away with doing it every 16 months. This all depends how often you use the surface. If you’re using your window sill to double as a table, bookcase, window seat, or shelf, you may need to do a 12-month treatment. So, if you want the look of a marble window sill, but prefer not to deal with the upkeep that natural stone window sills require, then that’s the angle you want to sell to your buyers. For those who feel that they absolutely cannot compromise on anything other than the natural authentic look of natural stone, then by all means, stock the natural marble window sill too. Stonexchange has it all. Whether you choose to incorporate natural marble window sills or imitation, we can ship you a bulk amount at wholesale price. We have six popular color variations that builders have found to be the most successful. 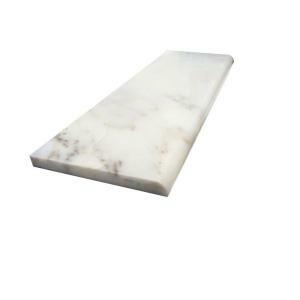 When it comes to getting a bulk amount of imitation marble window sills, then you need to speak with one of our representatives to discuss exactly what kind of colors you’re looking to stock in your warehouse. Call us today to discuss your options about which kind of window sill is the best for your future builds. We can be reached online through our contact form, or call us directly at 305-731-2400.